Hi again! Before I leave for corn-cation (I’ll be spending the fall in pumpkin land), I wanted to share one last (IF I can contain myself, that is) corn recipe. You need to make this with fresh corn muffins with basil, unless you have a fear of corn overload, in which case, stay far far away. But I say you should indulge while you can. You’ll regret it when the corn disappears for the year. And really, this soup is a beautiful thing. Why, you ask? Well, how often do you see corn soups that aren’t packed with cream or milk? This? Has nothing of the sort. Sure you see some sour cream in the photo below, but that’s simply for topping the corn soup if you choose (plus, I used fat-free). 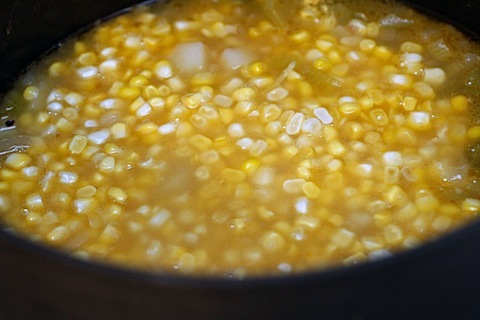 Other than that, the soup becomes creamy all from the help of the corn. And maybe some of your muscle strength. If you have any. Here we go again, cutting the corn off the cob. Make sure you don’t cut too close to the cob. 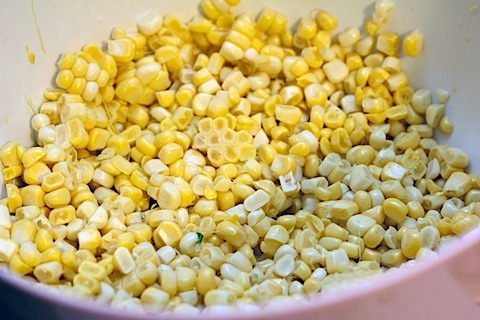 You should have about 3 1/2 to 4 C of corn kernels. But don’t throw away those cobs. In fact, I hope your arms aren’t tired. Because you’ve only just begun. Now, take one of the cobs and stand it on its ends in a shallow dish. Scrape as much off the cob as you can, extracting all the “milk” and solids possible. Repeat with the remaining cobs. This is what mine looked like. It took a lot of arm strength. At least for me. But I’m kinda weak. And I was most definitely using the wrong knife. Now, take those totally bare cobs and break them in half. Put them in a 4-quart pot with 6 cups of water and 1 teaspoon salt (and ignore the fact that I left some kernels on my cobs… Ooops. My arms hurt). 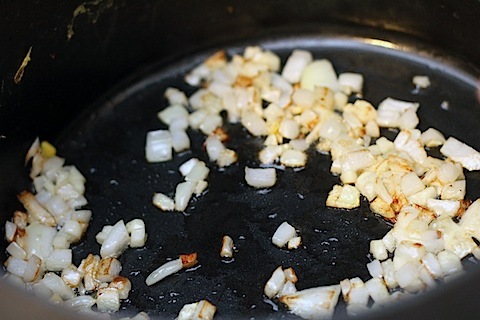 Bring to a boil over high heat and then reduce to medium low, cover, and simmer for about 30 minutes. 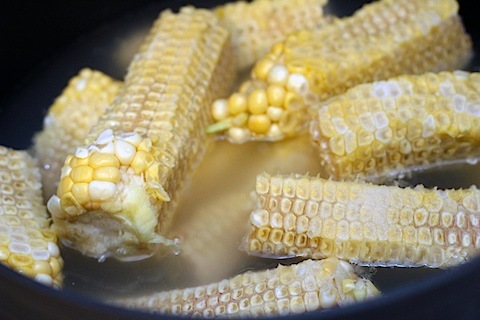 Then you can throw the cobs away, put the liquid in a separate bowl, and set aside. Put the pot back over medium-high heat and add oil. 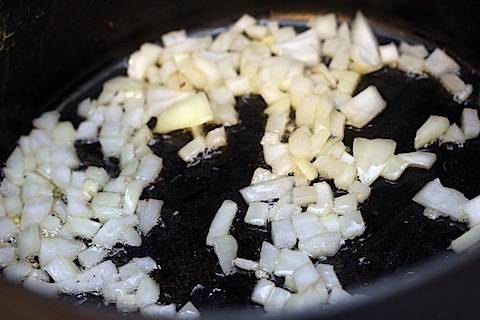 Sauté onion in the oil for about 3 minutes, until translucent. 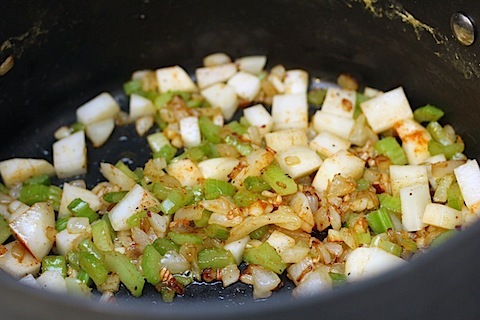 Then add the garlic and cook for another minute. Turn the heat down to medium and add celery. 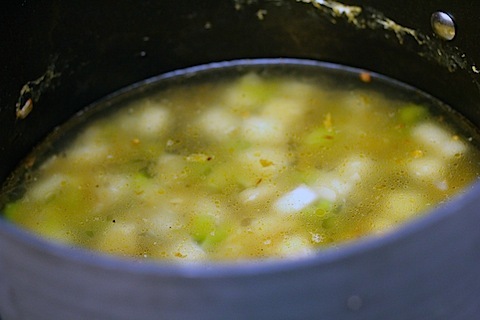 Cover the pot and continue to cook, making sure to stir occasionally for about 5 minutes, until the vegetables soften. Add the potatoes, pepper, and cayenne. Stir. Pour in the corn stock. Doesn’t that sound lovely? Corn stock. 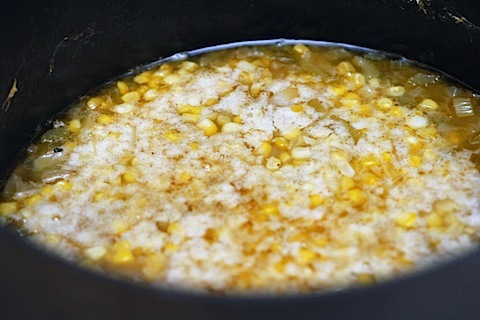 I think I shall cook only with homemade corn stock from now on. In fact, maybe I’ll can it and sell it. 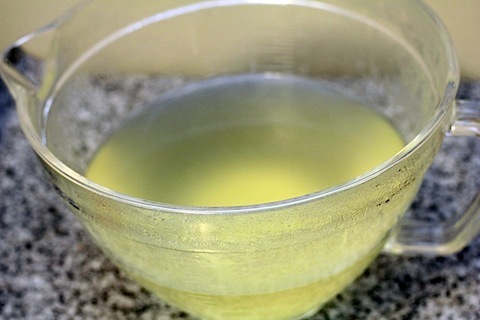 Bring to a boil over medium-high heat, then cover and lower the heat to medium-low. 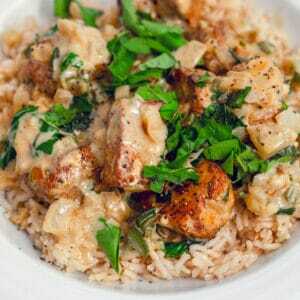 Simmer for about 20-30 minutes, until the vegetables are softened enough to puree. 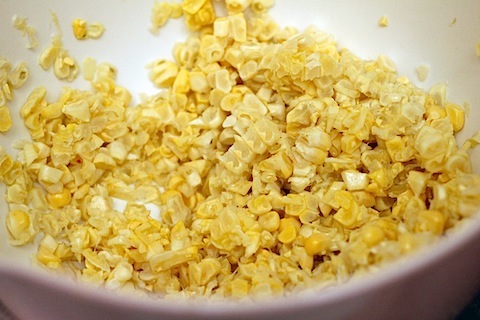 Add all of the corn kernels, except for 1 cup. Now you’re ready to puree the soup. For this you’ll need either an immersion (hand) blender or an actual blender. I recently got an immersion blender but hadn’t had any opportunity to use it for quite some time. This soup made me so just why I needed one. It made everything SO easy. I just stuck the immersion blender in the pot and blended away. 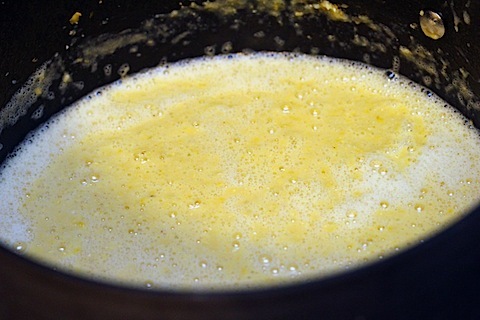 If you need to use a regular blender, just puree the soup in batches and pour it back in the pot when it’s all pureed. Now for the fun part. Taste it. And add more salt or pepper if needed. 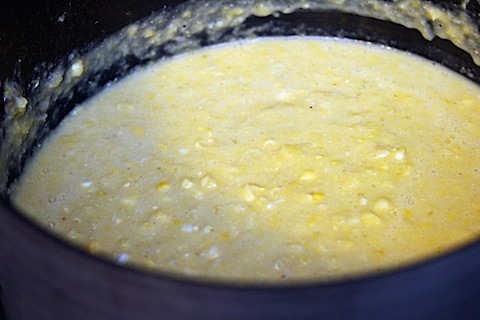 Add the rest of your corn and all that beautiful corn milk/solid you worked so hard to get. 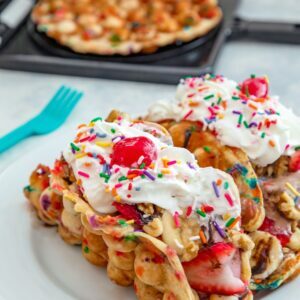 And serve warm or at room temperature, with as many toppings as you choose. I mean, you could even add bacon in there if you so desired. Why not, right? I’m honestly still kind of amazed that I made a soup so thick and creamy with no cream or milk or anything of the sort, whatsoever. This is just plain corn and was truly one of the creamiest soups I’ve had. One of life’s little miracles, I suppose. Or maybe it just goes to show what a whole lot of corn and a blender can do. The color of this soup is just pure happiness. Especially when contrasted with other brightly colored toppings. If I were smart, I would have made 10 batches of this and froze it for those long winter months. But my freezer is too small and constantly packed (with what? I don’t know). Plus, I generally prefer to enjoy seasonal vegetables in-season. Hence why I don’t eat pumpkin when it’s not autumn. Otherwise, I wouldn’t appreciate it half as much during its very special time of the year. Then again, this soup is pretty perfect for an end of summer stormy weekend. Do you have a favorite summer soup? 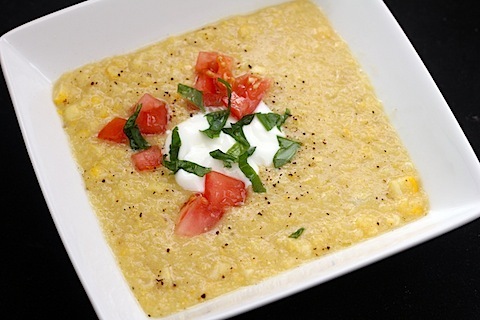 25 Responses to "Fresh Corn Soup"
My favorite summer soup is corn soup!!! I love the one that they have at Chili’s, but have been looking for a good recipe I can make at home. Will have to give this one a try!!!! A very bright and cheerful soup to brighten up a dull day:D I love the color and I can get corns the whole year round here so I can make this anytime:D Thanks for sharing! Hope you have a great weekend ahead! I love the colour of this soup – it sounds so fresh and delicious! 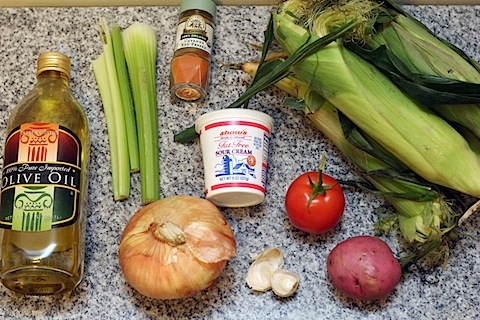 ha, actually before I started reading your post I went right to the ingredients to see how much cream was in there -something that always turns me off to corn soup…I’m definitely saving this recipe! This looks great! I love pureed veggie soups b/c of their innate creaminess… I remember a cauliflower soup I made this winter that really tasted like it had cream in it. 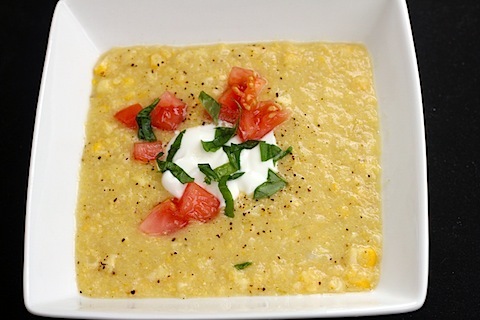 I’m definitely a fan of summer soups (I made a cold avocado soup a few times), so I need to make this corn version! I had amazing corn on the cob this week and am definitely going to miss it… that and blueberries and the variety of fruits… but I certainly am excited for pumpkin! Reason #4309 that I need an immersion blender. This soup looks delish. 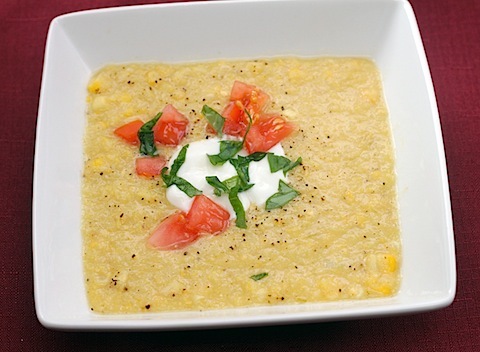 A corn soup at Mistral recently changed my life; I’ll need to replicate the experience with this recipe! We are happily knee deep in corn with roasted corn chowder waiting to be made – but I may also give this a go – it just beckons. I’m looking forward to incorporating corn into an interesting breakfast dish I’ve got planned for the weekend! I am such a huge corn fan. I’ve had corn chowder but never soup. This sounds wonderful! Love this especially since I have 6 ears of jersey corn in my fridge! Thanks! i am not a huge corn ON the cob fan, but i really do love corn. i’m on this. it sounds SO good! This sounds amazing! I can’t believe how creamy and rich it looks! I can’t wait to hear about your interview with Giada! The soup looks great! I am always iffy on summer soups…gazpacho is not my cup of tea (err, soup, sorry) and I’m never really craving hot things, but this looks perfect! Another delicious corn recipe! 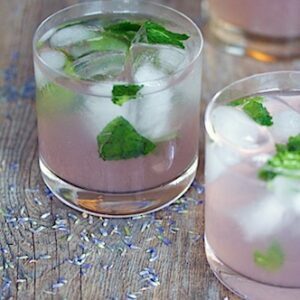 I can’t wait to get to the farmers’ market to try this and the corn muffins. I hope the weather holds out for you! What a wonderful opportunity to interview Giada. 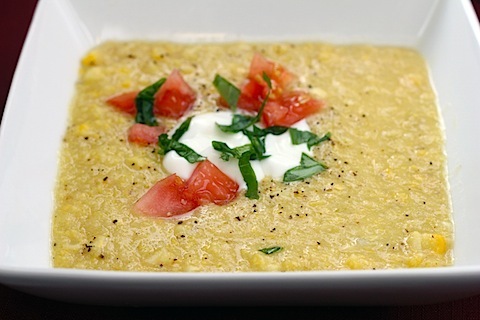 This corn soup looks delicious! I love that there is no cream in it. Have fun interviewing Giada!! A really delicious corn soup here, nice! This sounds awesome, but one part is confusing to me – why do you need to cut the cobs twice?! Can’t you just cut off all the kernals as close as you can to the cob, getting all the milk and everything in one go? 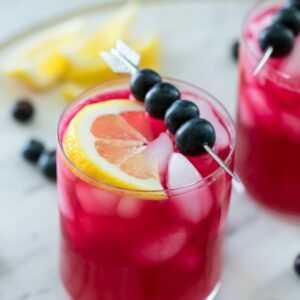 I’ve read this recipe twice and still just don’t get it, so hope you can help me out 🙂 Thanks!